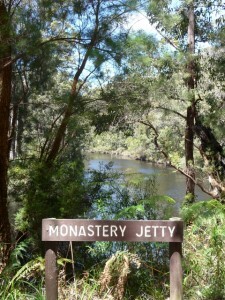 We dropped our kayaks in at Nornalup boat ramp and headed upstream towards Monastery Landing. The river has been glassy every time we’ve come past but today’s South Easterly wind has made the water a little choppy. During the first few hundred metres we pass the landing point for Nornalup Canoe Hire and a number of private jetty’s after a few more bends in the river we were on our own and away from civilisation. As this was our first time heading upstream on the Frankland River; we were not sure how far up Monastery Landing was or whether there is even anything there for us to know when we’ve reached it! 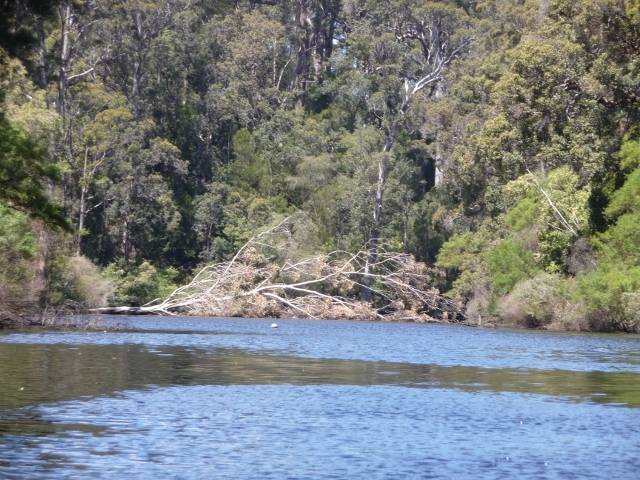 A few trees had fallen across the river recently including a Karri tree only 200m before Monastery Landing that spread almost the whole way across the river; leaving a gap just wide enough for our kayaks. It turns out there is a landing there and we pulled our kayaks up on to it and stopped for a drink and an apple on the picnic tables provided; it would be a nice spot to come back to for a picnic lunch. When the first settlers were looking through this area, a team sailed up the Frankland River from what is now called Nornalup (approximately 10 km east of Walpole). The majestic beauty of one particular spot, where the trees overhung the river from both sides, overawed a surveyor’s assistant in the party. There was a feeling of peace, with the birds singing and the early morning sunlight filtering through the branches. He gasped, and said, “It’s as quiet as a monastery”. And “Monastery Landing” it has been called ever since.